Creative Last Minute Fitness Gift Ideas For The Fitness Lover Or Bodybuilder In Your Life! Another hectic holiday season is upon us, and in December gift giving is the subject at hand. I have done the research for you and come up with a list of creative gifts for the fitness lover, the calorie watcher, cardio queen, or bodybuilder in your life. From the totally unnecessary to the can't live without, these items range from the affordable and practical to the pricey and super-cool. Even though it is the season of giving, you can pick up some of these great gadgets for yourself! The Watermill is really a dehumidifier that actually uses the water out of the air, and purifies it to drinking quality. Since inside air is 70% more polluted, this gadget goes outside and can pump out 12 liters a day! 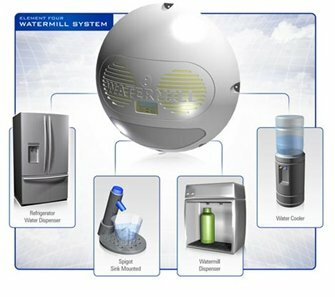 Technically speaking, the WaterMill is an atmospheric water collection device that condenses water vapor and purifies it. In English: It's a home appliance that makes drinking water for your whole family - using only air. The system draws in moist, outside air through an air filter. The moist air passes over a cooling element, condensing the moist air into water droplets. This water is then collected, passed through a specialized carbon filter and is then exposed to an ultraviolet sterilizer, eliminating bacteria. The result? You have taken control of your family's drinking water needs. Once drinking water is created, it goes to the point of use devices in your home: your refrigerator, spigot, water cooler or back splash dispenser. The WaterMill is designed for home use, producing enough water for a family to drink and cook with every day. 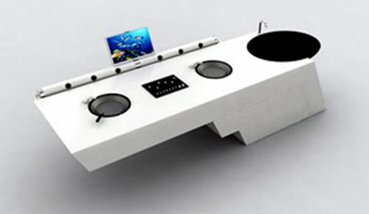 This beautifully designed table has a dual stove counter top, a sink, and a built in multimedia computer setup. This smart table will help you spice up your favorite recipes, or find recipes online. Now if it could just feed you. The Taste DJ kitchen Table. The SwiMP3 v2 underwater MP3 player is an incredible audio experience. Imagine listening to hours of your own music during your swim workout. The SwiMP3's innovative sound transfer technology offers exception underwater sound quality. Standard players rely on the transmission of sound through air or water causing the swimmer to perceive only muffled noise. The SwiMP3 uses bone conduction - the direct transfer of sound vibrations from the cheek bone to the inner ear - to provide the swimmer with exceptional sound clarity. 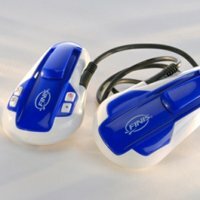 The SwiMP3 is fully waterproof and can be used with all the competitive swim strokes. The new SwiMP3 is revolutionary in that it relies on bone conduction of sound. When the device is placed on any bones of the skull (i.e. the cheek bones or the mastoid tip) it leads to vibration of the fluid in the inner ear. Thus swimmers can enjoy clarity of sound with the SwiMP3 device that was never before possible. Bone conduction hearing is a safe, well-established hearing mechanism in humans that the SwiMP3 player leverages to enhance aquatic activity. Finis's application of the technology brings an entirely new level of experience to swimmers, either while working out or taking a leisurely swim. Long runs, tempo runs, speed drills. You expect a lot from your body and from your training gear. Meet Forerunner 405. This GPS-enabled sport watch tracks your training, then wirelessly sends your data to your computer. The ultimate in training technology, its sleek design features a touch bezel that lets you quickly scroll and select features on the run. Loaded with serious training features, Forerunner 405 continuously monitors your time, distance, pace, calories and heart rate (when paired with heart rate monitor). Each run is stored in memory so you can review and analyze the data to see how you've improved. You can even download recorded courses to compete against previous workouts or race a Virtual Partner®. Customize Forerunner's data screens for instant feedback while you train. Sport watch and personal trainer - Forerunner 405 gives you the best of both worlds in a sleek, stylish package. 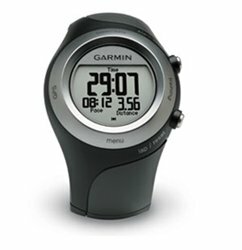 This high performance watch is easy to use and comfortable to wear when not training. Simply tap the touch bezel to change screens without fumbling for a button. Forerunner 405 comes in two color options - black or green - to fit your style. Once you've logged the miles, innovative ANT+ wireless technology automatically transfers data to your computer when the Forerunner is in range. No cables, no hookups. The data's just there, ready for you to analyze, categorize and share through our online community, Garmin Connect or our optional Garmin Training Center® software. You can wirelessly send workouts from your computer to Forerunner, too. Forerunner 405 is available with or without a heart rate monitor (see the versions tab) to help you make the most out of your training. Versions with a digital heart rate monitor continuously track heart beats per minute. Train in a certain heart rate zone to improve your fitness level or compare your pace and heart rate to past performance on the same run. Take your training inside with the versatile Forerunner 405. Pair it with an optional foot pod to track your speed, distance and running cadence indoors when a GPS signal is unavailable. This new design clips onto your laces for easy removal and automatically turns on when you start moving. You can also add a speed/cadence bike sensor to track the speed and distance of your cycling workouts. Lock Onto Satellite Signals, Forerunner 405 sports a unique design that gives the GPS antenna a better view of the sky, so it can get a stronger signal during your run. And its high-sensitivity GPS receiver provides improved tracking under trees and near tall buildings. The Polar F55 provides you with the ultimate fitness experience. Because cardiovascular exercise, strength training, and relaxation are essential to maximum well-being, the Polar F55 gives the modern fitness enthusiast a complete exercise session by adding new features like Body Workout and OwnRelax. Body Workout, a muscular strength-training guide can be adjusted according to the exerciser's progress, provides basic guidance for strength training. The new OwnRelax feature, checks the body's state of relaxation, and helps exercisers listen to their bodies, an essential component of fitness. 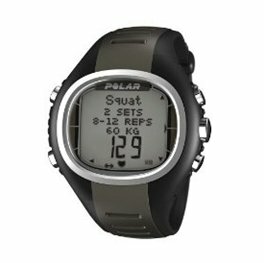 Polar F55 Heart Rate Monitor Watch. Nike + iPod Sport Kit: This is an inexpensive way to get excited again about walking and running with an existing iPod Nano or an iPod Touch. When synced with a sensor in your shoe, your iPod's screen shows time, pace and calories burned. A voice interrupts the music to announce when you've reached a goal or have a few minutes left in a timed workout. The Nike+ iPod® Watch Remote lets you hear how you run with instant voice feedback of your time, distance, calories burned and pace. 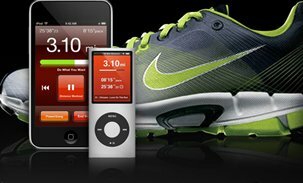 Working in conjunction with your Nike+ iPod Sport Kit and iPod, this wonder of a remote lets you access both your music and workout features without having to reach for your player. And, yes, it even tells the time. 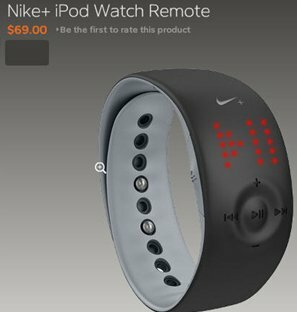 Nike + iPod Watch Remote. 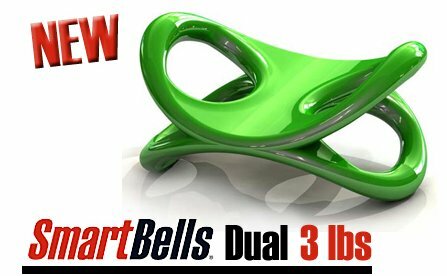 If you're looking for a way to spice up your weight training workout, or maybe just need an exercise system that's compact and good for travel, you might want to check out Smart Bells from Think Fit. As you can see from the picture, they're a bit different than your average free weights. The sculptural weights are meant to uniquely conform to the shape of your body, and they flow aerodynamically as you move them through the circular motions of the patented Smart Bells Routine. It's supposed to be a combination of strength training with aerobics, which incorporates Tai Chi and Yoga moves into the workouts; There is an instructional DVD included! "This bottle is extruded from one solid piece of Aluminum in a special manufacturing process in Switzerland. The inside of the bottle is then coated with a water-based non-toxic liner and baked at a high temperature until it fuses to the metal, thus creating a protective barrier. 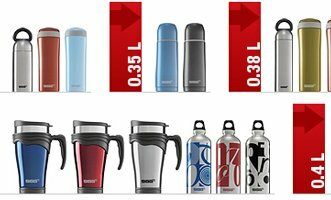 Many independent researchers have conducted tests on the liner in Europe and the United States, and have concluded our liner does not allow anything into the drink. Monitor your weight, body fat and visceral fat for healthy weight loss. Monitor your skeletal muscle and resting metabolism to keep weight off. Track your progress with memory display Accurate body composition calculation using Bio electrical Impedance Technology. Body fat and muscle tissue have different levels of electrical conductivity. Monitor your weight, body fat and visceral fat for healthy weight loss. Monitor your skeletal muscle and resting metabolism to keep weight off. Track your progress with memory display Accurate body composition calculation using Bioelectrical Impedance Technology. The Body Composition Monitor with Scale sends a safe, low-level electrical current through your body to calculate body fat percentage, skeletal muscle percentage, resting metabolism, and visceral fat level. This is known as the Bio electrical Impedance (BI) Method. Your body composition is automatically calculated using the electrical impedance, your height, weight, age and gender information. The Omron® Body Composition Monitor with Scale provides you with the accurate and reliable information you need to help measure your progress in achieving your health and fitness goals. It measures the whole body to avoid the influence of fluctuations. The ratios of the water in your upper body and lower body may change through the day. This means that the electrical impedance of the body also varies. Since the HBF-500 uses sensors for both the hands and feet to take measurements, it can reduce the influence of water movement on the measurement results. Harbinger Big Grip No-Slip Lifting Strap is made from heavy duty nylon. Dura-Grip rubber provides added strength. The 21.5" Dura-Grip rubber strips grab the bar for a "no-slip" grip when lifting. Extended length allows you to wrap the bar several times. Merrowed end tabs help prevent fraying. When using the strap, the rubber strip side must always face the bar. Harbinger Big Grip No-Slip Lifting Strap is made from heavy duty nylon. Dura-Grip rubber provides added strength. The 21.5" Dura-Grip? rubber strips grab the bar for a "no-slip" grip when lifting. VitaMinder's Diet Scale is attractively designed to weigh foods accurately and conveniently for dieters and for routine kitchen use. The easy-to-read dial is calibrated in half-ounce increments to one pound and also in 10-gram increments to 500 grams. Including the food tray, the Scale stands 6.25 inches tall. Do you have problems deciding what gift to get for that special bodybuilder? Maybe you just don't know what type of products they use. Either way we have the solution for you. We now offer Bodybuilding.com Gift Certificates! They can be used to purchase anything in our store, including items that are on clearance, accessorizes, and the stylish clothing that we offer. The gift certificate will include the sender's name, the recipient's name and a message. Redeemable for thousands of items The perfect present for friends, family, and business associates. Sent electronically via e-mail. No need to wait for shipping; it's available once your order is approved!